Fig. 1.1 Map of the Tadrart Acacus and the central Saharan massifs. 2Farmers, caravaneers and herders in this area all participated and intercepted in a variety of socio-economical exchanges that developed from the first millennium BC to the present day. In spite of its arid climate, the central Sahara has, in the last 3,000 years, seen some extremely successful human adaptations to limited resources. An intangible heritage of indigenous knowledge allowed complex societies to flourish in the largest desert in the world. That heritage has left a legacy of tangible evidence in the form of remains, such as forts, monuments, burials, and settlements, all of which have been the focus of recent archaeological studies. 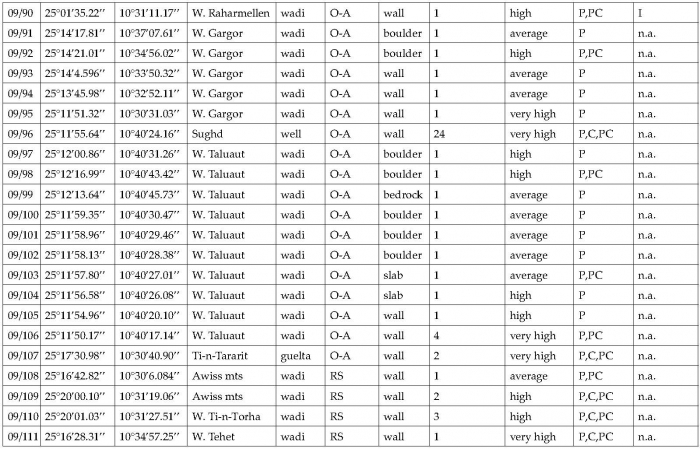 This paper deals with the less investigated element of the archaeological and historical landscape of the region: the Tifinagh inscriptions carved and painted on the boulders, caves and rock shelters of the Tadrart Acacus valleys. 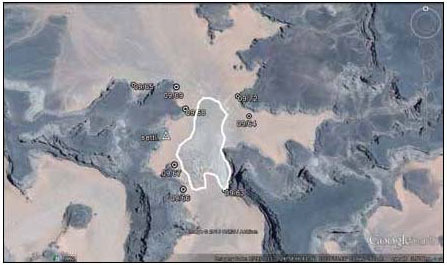 4In the last fifteen years, the work of the Libyan-Italian Archaeological Mission of the local Department of Archaeoloy (DoA) and Sapienza University of Rome focused on the village and adjacent necropolis of Fewet,7 the fortified settlement of Aghram Nadharif (close to the Ghat area),8 some funerary monuments in the Wadi Tanezzuft,9 and on two forts located east of the Acacus massif.10 The still-inhabited mountain range of the Tadrart Acacus, cut by dozens of dry river valleys, has been largely neglected. However, in recent years, the development of ethnoarchaeological studies11 has further enlarged the aims of the DoA-Sapienza research to include modern and contemporary civilisations. In fact, the study of human-environment interaction in such a hyper arid region has become one of the hottest topics in the debate around sustainable development in dry lands. The impact of social science in the design and development of possible solutions to mitigate the effects of drought in dry regions has been low and scarcely significant so far. Major involvement from social scientists in the issue of sustainable development has been again recently voiced at the international level.12 There is a strong need to develop integrated approaches focused on the study of the indigenous knowledge in arid lands, by the adoption of archaeological, geoarchaeological, historical and anthropological tools to unveil the practices of variable resource management by desert communities. 5The long tradition of scientific research in the area makes the Tadrart Acacus an ideal place to adopt a multi-pronged approach focusing on landscape, where data from historical and modern times are integrated with the study of the ethnographic present.13 These new studies have deeply affected our perception of the whole Acacus landscape, paving the way to more nuanced reasoning about the human-environment interaction in both the modern and historical context. 19 Aghali-Zakara and Drouin, Inscriptions rupestres libyco-berbères. 7The Saharan texts, however, have been rarely subjected to systematic recording and publication.17 In the absence of any bilingual texts, the translation of Saharan inscriptions is extremely difficult. However, some attempts have been made, and they seem to confirm that Tifinagh was mainly used to write short personal messages, epitaphs, and “tags”.18 A further hurdle to translation is that these texts normally feature metaphors — alterations of signs and/or words — so that they become hardly readable. It has been suggested that some inscriptions have a “ludique” character whose aim was precisely to prevent the comprehension by anyone other than the author and the recipient (s) of the message.19 Tifinagh texts present interpretive problems similar to those raised by Saharan rock art, such as its interpretation, meaning, and chronology. Therefore, the EAP265 project aimed to: 1) create a database of all the available data regarding Tifinagh inscriptions noticed in the past surveys; 2) digitally record known and unknown Tifinagh sites on the ground; and 3) make available an open access dataset. 20 Di Lernia, N’siala and Zerboni, “Saharan Waterscapes”. 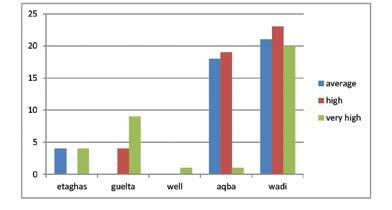 8During the fieldwork we carried out in October to December 2009 we identified 124 sites (Table 1.2; Fig. 1.2). Our landscape approach included two main field methods. The first method was geomorphologically inspired, and featured visits to the most relevant water points and other locations of interest such as passageways and what we later discovered to be crop fields. In the Tadrart Acacus, water occurs in the form of gueltas (rock pools where rainfall gathers) and wells. Gueltas have been subjected to investigation by the “Saharan Waterscapes” project, as have etaghas (empty spaces where crops can be raised after floods).20 The aqbas (passageways) that connect the western oases (Tahala, Ghat, Barkat and Fewet) to the valleys of the Tadrart Acacus, have been surveyed, since these are still to this day a key element of the Acacus landscape. Those mountain trails feature variable gradients and climb for up to 300 metres. In addition, some of the Kel Tadrart elders showed us a variety of previously unknown sites. Fig. 1.2 Map of the Tadrart Acacus with the sites recorded for the Endangered Archives Programme sorted by significance. White circle: average; white dot: high; grey dot: very high (adapted from Biagetti et al., 2012). Fig. 1.3 An example of Tifinagh inscription, site 09/87B (EAP265/1/87B). Photo by R. Ceccacci, CC BY. 23 Biagetti, Kaci, Mori and di Lernia, “Writing the Desert”. Fig. 1.4 The Basmala inscription from site 09/67. 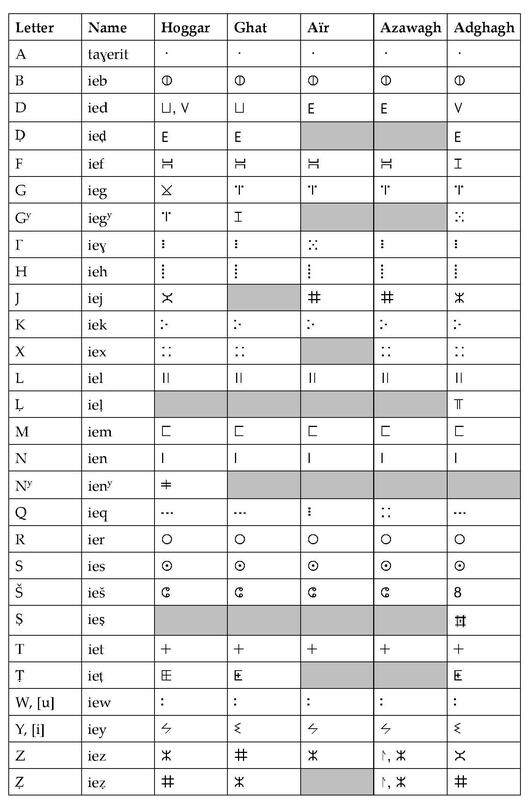 11Most of the Tifinagh sites include lists of anthroponyms that in some cases are veritable genealogies going back several generations. 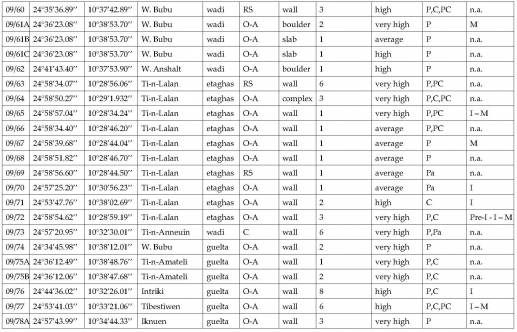 More than 135 anthroponymic sequences have been identified so far, and site 09/92 is likely to include the longest genealogy so far known in Libyco-Berber epigraphy.24 After the spread of Islam, the Tuareg and other Berber populations adopted Arab names. This “neo-anthroponymy” includes names borrowed from the most prominent personalities of Islam; the Tadrart Acacus, for example, features the names Mohamed (37 cases), Ahmed (26), Moussa (17), Fatima (16), and Ali (16). The Basmala (a phrase used by Muslims, often translated as “in the name of God, the Most Gracious, the Most Merciful”) occurs once (Fig. 1.4). Occasionally, love messages have been recorded as well. In four cases, place names have been recognised: these are TDMKT (read Tadmekka, site 09/85A), likely referring to Es-Souk, an important centre located in Mali and traditionally inhabited by Tuareg; MK (T) (read Mecca, site 09/92), the Islamic Holy City; TŠWNT (read Teshuinat, the largest Acacus wadi, in 09/73, Fig. 1.5); and TGMYT (read Tagamayet “place where there is some couch grass”, in Wadi Raharmellen, 09/88). Furthermore, the same graphist (i. e. author) named Biya, can be recognised in various sites where he left his signature: the same author has written text in at least four sites throughout the Tadrart Acacus, including 09/63 located in the Ti-n-Lalan area, 09/90 in wadi Raharmellen (c. 7 km northeast from site 09/63), 09/37 in wadi Tasba (c. 35 km north from site 09/63), and 09/82A in Tejleteri (c. 13 km east-north-east from site 09/63). Fig. 1.5 Site 09/73 features the toponym of Teshuinat (TŠWNT). 12The short discussion above shows the potential of this kind of study. Besides that, it is the place of these inscriptions that holds relevance for the comprehension of the whole landscape. It is often noted that Tifinagh texts are usually short and there is no literature published in Tifinagh characters. Whilst one may accept this reductionist view on Tifinagh on the whole, the case of the Tadrart Acacus allows us to go beyond the intrinsic limits of these kinds of inscriptions, by adopting a landscape approach. As Christopher Chippindale and George Nash argued in a synthesis of different approaches to rock art, it is likely that the firmest attribute of human-made signs on the stone is their place.25 The position in the space of the Tifinagh signs thus represents a solid starting point. 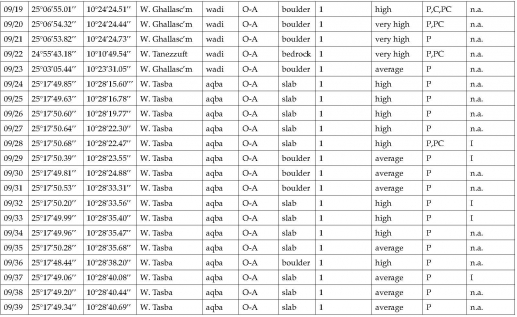 The 124 Tifinagh sites recorded (Table 1.2) are found in a variety of landscape contexts, occurring along aqbas (30.6%), wadis (51.6%), gueltas (10.5%), etaghas (6.5%), and the only well (0.8%) (Table 1.3). Most of the Tifinagh evidence has been recorded in open air sites (111, around 90%), and only a small percentage comes from caves and rock shelters (Table 1.4). 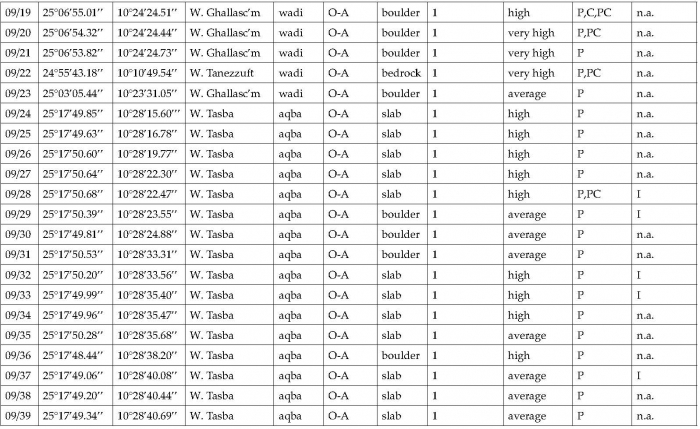 Nearly half of the Tifinagh inscriptions were carved or painted on boulders and slabs, the rest occurring on the sandstone walls of rocky cliffs (Table 1.5). 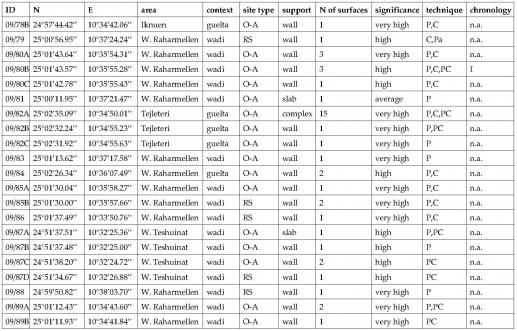 Most of the evidence (79.9%) consists of single-surfaced sites, whereas multi-surfaced sites occur less frequently (Table 1.6). Regarding the significance, the three categories (average, high, very high) are evenly distributed (Table 1.7). The four types of techniques were unevenly used, with pecking largely occurring in the majority of cases (>60%) (Table 1.8). Occasionally a mixed technique featuring first pecking and then a regularisation obtained by carving was recorded. The case of painting is different: the type of surface was not among the causes that drove that specific choice. It is worth stressing that three out of four painted inscriptions occurred in cave (1) and rock shelters (2). 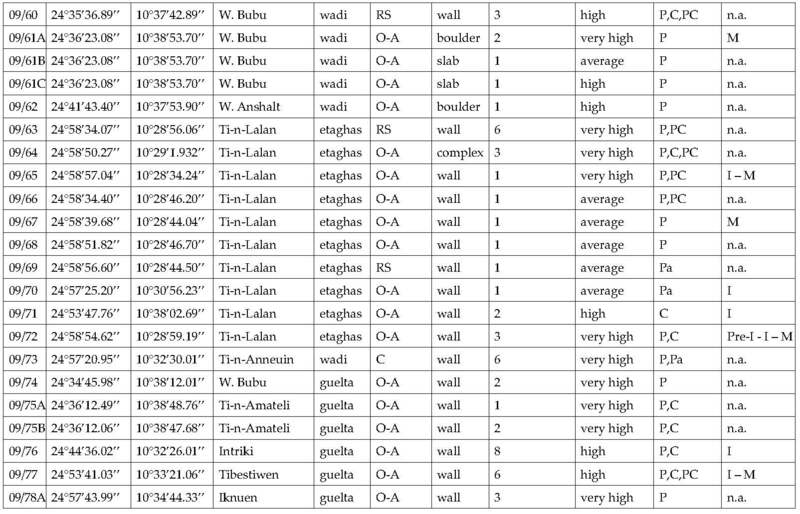 Unfortunately, the chronology of the inscriptions has been determined so far only for 19.4% of the sites. 13As a whole, the Acacus repertoire looks rather modern. The Tadrart Acacus is inhabited by a single lineage of Tuareg, the Kel Tadrart, whose existence has been noted since the first colonial-period reports.26 There is no evidence that in the last century other groups regularly frequented the Acacus, although there may have been occasional “incursions”. If this suggests that the Kel Tadrart are the likely authors of the modern inscriptions, it does not tell us who wrote the texts in the Islamic age. The low proportion of the sites for which dating can be securely determined makes development of further historical hypotheses difficult. Fig. 1.6 Significance and context of Tifinagh sites. 14Going back to our landscape approach, a considerable proportion of high importance Tifinagh texts are located in sites that have a connection to water, whether the gueltas, the etaghas, or the sole well (Fig. 1.6). The aqbas also have a large number of sites, but these are generally less complex and their texts shorter than those recorded around water. Even so, these texts can be used to better understand the use of landscape by its inhabitants. 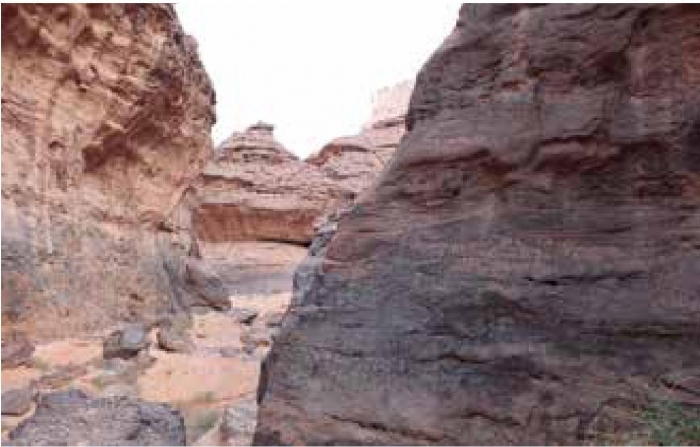 For example, in the Tadrart Acacus there are at least six main mountain trails that connect the large wadis of the east to the oasis set along the wadi Tanezzuft to the west of the Tadrart Acacus (see Fig. 1.2). The occurrence of Tifinagh is a clear sign of the use of a determined route (Fig. 1.7), as in the case of wadi Tasba. Fig. 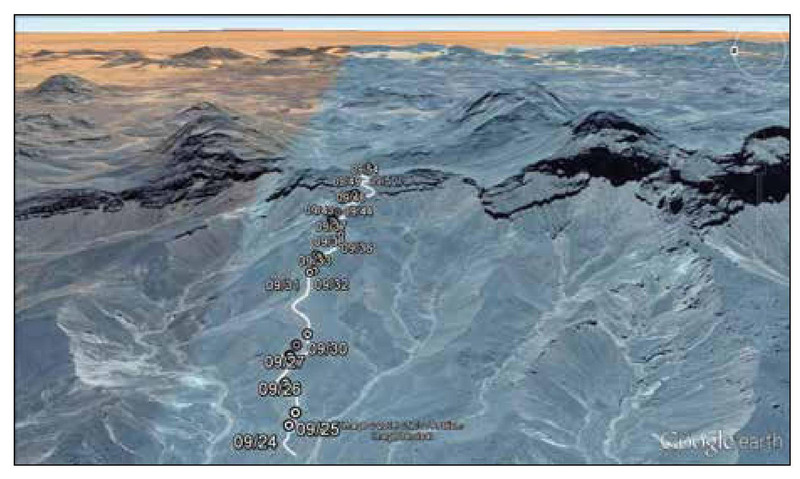 1.7 3D view of the aqba of wadi Tasba on the western escarpment of the Tadrart Acacus (map for Google Earth). 27 Di Lernia, N’siala and Zerboni, “Saharan Waterscapes”. Fig. 1.8 Site 09/74, close to the guelta of wadi Bubu (EAP265/1/74). Photo by R. Ceccacci, CC BY. 29 Di Lernia, N’siala and Zerboni, “Saharan Waterscapes”. 32 Ibid., and Biagetti, Ethnoarchaeology of the Kel Tadrart Tuareg, ch. 5. Fig. 1.9 Etaghas Ti-n-Lalan: the white line borders the etaghas, the dots indicate the Tifinagh sites, and the triangle refers to the Kel Tadrart settlement (map from Google Earth, adapted from di Lernia et al., 2012). 35 Di Lernia and Gallinaro, “Working in a UNESCO WH Site”, Fig. 6, p. 170. 36 Ibid., Table 2, p. 167. 17Recent research shows that the late Holocene rock art follows a clear pattern of spatial distribution in the Tadrart Acacus.33 The later phase that includes the so-called “Camel style” can be considered as roughly contemporary to the earliest Tifinagh inscriptions in the Tadrart Acacus. Dating rock art, like dating Tifinagh, poses many challenges. However, scholars agree that the Camel phase began before the end of the Garamantian age (AD 700) and further developed until modern times.34 In some areas of the Acacus, concentrations of Camel style subjects have been identified35 and these overlap with several Tifinagh sites, with the exception of those set on the aqbas along the western side of the mountain. 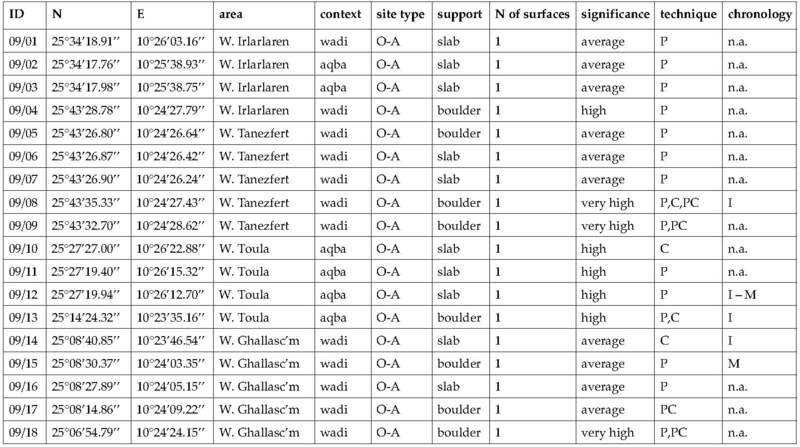 According to di Lernia and Gallinaro, 83.5% of Camel phase rock art is to be found within caves and/or rock shelters, whilst the Tifinagh inscriptions mainly appear on open air sites (89.5%).36 An anthropogenic deposit from a rock shelter along wadi Teshuinat (central Acacus) allowed to obtain the C14 date (1260±60 uncal. BP, i.e. some 1,000 years ago) placing it in the Islamic period.37 It is the only securely dated material in the Acacus valleys but, given the occurrence of Camel phase rock art, it seems likely that the top archaeological layers in Tifinagh inscription sites would yield a similar date. 38 Liverani, “Imperialismo, colonizzazione e progresso tecnico”; and Wilson. 39 Biagetti, Ethnoarchaeology of the Kel Tadrart Tuareg, ch. 4. 40 Di Lernia, N’siala and Zerboni, “Saharan Waterscapes”, pp. 117-19. 19As well as being markers of human movement, the Tifinagh inscriptions of the Tadrart Acacus are also signs of permanence, as indicated by their occurrence along some of the largest and most relevant wadis, such as Raharmellen and Teshuinat. These are the places where better pastures are to be found,39 and they continue to be the sites of current Kel Tadrart occupation. The discovery that cultivation was practiced in the etaghas has opened a window on what was until recently thought to be an exclusively pastoral landscape. Overriding the traditional dialectic between the desert and the sown, between nomads and farmers, the etaghas of the Acacus offer promising avenues of interpretation of the cultural trajectories in arid lands.40 Not dissimilarly, the use of the gueltas is highlighted by the presence of Tifinagh. From an ethnoarchaeological perspective, it is highly significant to unveil the relationships between current inhabitants of the Acacus and the major features of the landscape. This is relevant to our view of a previously undifferentiated landscape, punctuated by dozens of gueltas, and cut by a number of aqbas. The study of the Tifinagh evidence is thus as significant as that of rock art and other archaeological and historical data. The Tifinagh inscriptions emerge as one of the most tangible remains of the heritage of intangible knowledge that has allowed humans to inhabit the harsh land of the Tadrart Acacus in recent and modern times. Fig. 1.10 Site 09/73, Ti-n-Anneuin, vandalised in 2009 (EAP265/1/73). Photo by R. Ceccacci, CC BY. Aghali-Zakara, Mohamed, “Les lettres et les chiffres: écrire en Berbère”, in À la croisée des études libyco-berbères. Mélanges offerts à Paulette Galand-Pernet et Lionel Galand, ed. by Jeannine Drouin and Arlette Roth (Paris: Geuthner, 1993), pp. 141-57. —, “Unité et diversité des libyco-berbères (2)”, La lettre du RILB, 8 (2002), 3-4. —, and Jeannine Drouin, Inscriptions rupestres libyco-berbères Sahel nigero-malien (Geneva: Droz, 2007). —, and Jeannine Drouin, “Écritures libyco-berbères: vingt-cinq siècles d’histoire”, in L’aventure des écritures: naissances, ed. by Anne Zali and Annie Berthier (Paris: Bibliothèque Nationale de France, 1997), pp. 99-111. Ait Kaci, Ali, “Recherche sur l’ancêtre des alphabets libyco-berbères”, Libyan Studies, 38 (2007), 13-37. Barich, Barbara E., “La serie stratigrafica dell’Uadi Ti-N-Torha (Acacus, Libia)”, Origini, 8 (1974), 7-157. —, “The Uan Muhuggiag Rock Shelter”, in Archaeology and Environment in the Libyan Sahara: The Excavations in the Tadrart Acacus, 1978-1983, ed. by Barbara E. Barich (Oxford: BAR International Series, 1987), pp. 123-219. Barnett, Tertia and David Mattingly, “The Engraved Heritage: Rock-Art and Inscriptions”, in The Archaeology of Fazzan: Volume 1. Synthesis, ed. by David J. Mattingly (London: The Society for Libyan Studies, 2003), pp. 279-326. Biagetti, Stefano, Ethnoarchaeology of the Kel Tadrart Tuareg: Pastoralism and Resilience in Central Sahara (New York: Springer, 2014). 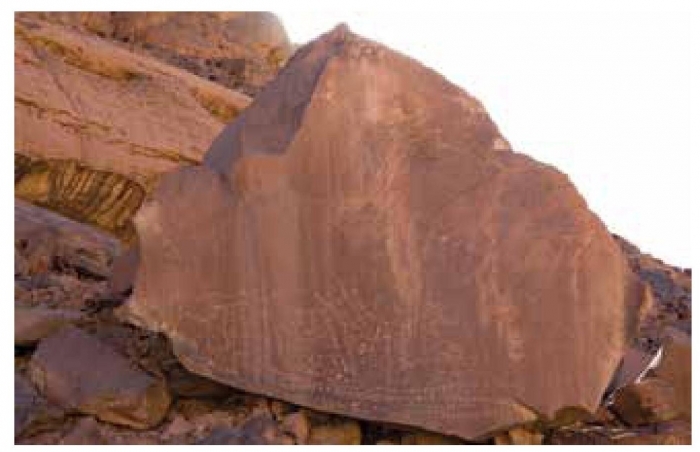 —, Ali Ait Kaci, Lucia Mori and Savino di Lernia, “Writing the Desert: The ‘ Tifinagh’Rock Inscriptions of the Tadrart Acacus (South-West Libya)”, Azania, 47/2 (2012), 153-74. —, and Jasper Morgan Chalcraft, “Imagining Aridity: Human-Environment Interactions in the Acacus Mountains, South-West Libya”, in Imagining Landscapes: Past, Present, and Future, ed. by Monica Janowski and Tim Ingold (Farnham: Asghate, 2012), pp. 77-95. —, and Savino di Lernia, “Reflections on the Takarkori Rockshelter (Fezzan, Libyan Sahara)”, in On Shelter’s Ledge: Histories, Theories and Methods of Rockshelter Research, ed. by Marcel Kornfeld, Sergey Vasil’ev and Laura Miotti (Oxford: Archaeopress, 2007), pp. 125-32. 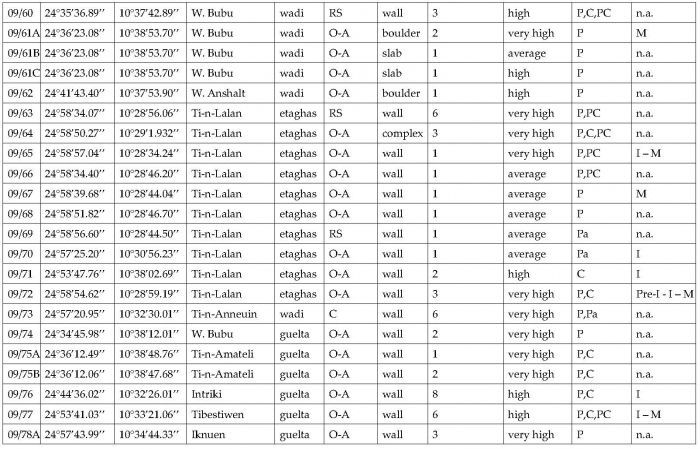 —, and Savino di Lernia, “Combining Intensive Field Survey and Digital Technologies: New Data on the Garamantian Castles of Wadi Awiss, Acacus Mts., Libyan Sahara”, Journal of African Archaeology, 6/1 (2008), 57-85. 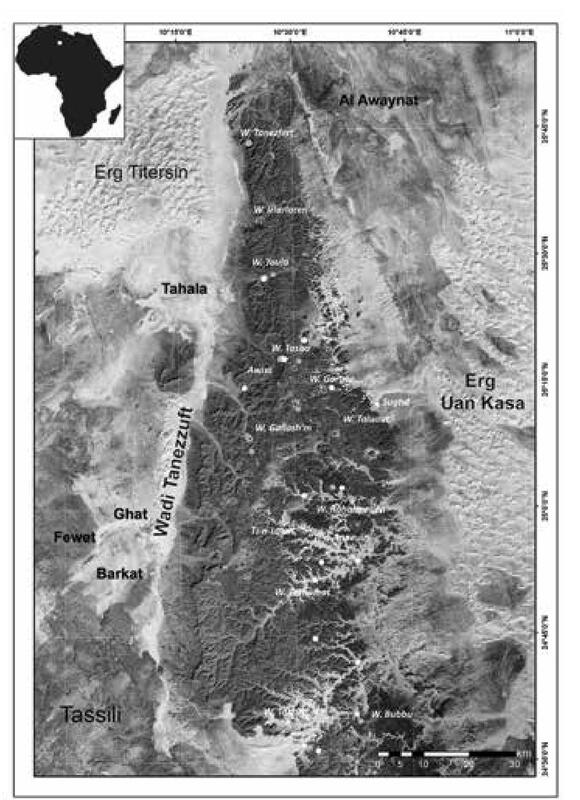 —, and Savino di Lernia, “Holocene Deposits of Saharan Rock Shelters: The Case of Takarkori and Other Sites from the Tadrart Acacus Mountains (Southwest Libya)”, African Archaeological Review, 30/3 (2013), 305-38. Camps, Gabriel, “Recherches sur les plus anciennes inscriptions libyques de l’Afrique du nord et du Sahara”, Bulletin Archéologique du C. T. H. S., n. s. (1974-1975), 10-11 (1978), 145-66. Castelli, Roberto, Maria Carmela Gatto, Mauro Cremaschi, Mario Liverani and Lucia Mori, “A Preliminary Report of Excavations in Fewet, Libyan Sahara”, Journal of African Archaeology, 3 (2005), 69-102. Chippindale, Christopher, and George Nash, eds., The Figured Landscapes of Rock-Art: Looking at Pictures in Place (Cambridge: Cambridge University Press, 2004). Cremaschi, Mauro, and Savino di Lernia, “The Geoarchaeological Survey in the Central Tadrart Acacus and Surroundings (Libyan Sahara): Environment and Cultures”, in Wadi Teshuinat: Palaeoenvironment and Prehistory in South-Western Fezzan (Libyan Sahara), ed. by Mauro Cremaschi and Savino di Lernia (Milan: CNR, 1998), pp. 243-325. —, and Savino di Lernia, “Holocene Climatic Changes and Cultural Dynamics in the Libyan Sahara”, African Archaeological Review, 16 (1999), 211-38. Di Lernia, Savino, ed., The Uan Afuda Cave: Hunter-Gatherer Societies of the Central Sahara (Florence: All’Insegna del Giglio, 1999). —, and Marina Gallinaro, “Working in a UNESCO WH Site: Problems and Practices on the Rock Art of the Tadrart Acacus (SW Libya, central Sahara)”, Journal of African Archaeology, 9 (2011), 159-75. 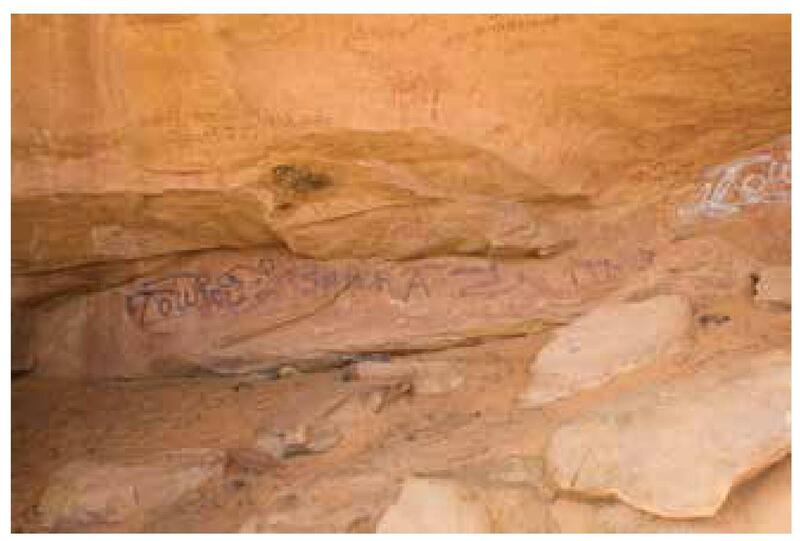 —, Marina Gallinaro and Andrea Zerboni, “Unesco World Heritage Site Vandalized: Report on Damages to Acacus Rock Art Paintings (SW Libya)”, Sahara, 21 (2010), 59-76. —, and Giorgio Manzi, eds., Sand, Stones, and Bones: The Archaeology of Death in the Wadi Tanezzuft Valley (5000-2000 BP) (Florence: All’Insegna del Giglio, 2002). —, Isabella Massamba N’siala, and Andrea Zerboni, “‘Saharan Waterscapes’: Traditional Knowledge and Historical Depth of Water Management in the Akakus Mountains (SW Libya)”, in Changing Deserts: Integrating People and Their Environment, ed. by Lisa Mol and Troy Sternberg (Cambridge: White Horse Press, 2012), pp. 101-28. Dunne, Julie, Richard Evershed, Melanie Salque, Lucy Cramp, Silvia Bruni, Kathleen Ryan, Stefano Biagetti and Savino di Lernia, “First Dairying in ‘ Green’Saharan Africa in the 5th Millennium BC”, Nature, 486 (2012), 390-94. Edwards, David, “Archaeology in the Southern Fazzan and Prospects for Future Research”, Libyan Studies, 32 (2001), 49-66. Farrujia de la Rosa, José, Werner Pichler and Alain Rodrigue, “The Colonization of the Canary Islands and the Libyco-Berber and Latino-Canarian Scripts”, Sahara, 20 (2009), 83-100. Field, Cristopher B., Vicente Barros, Thomas F. Stocker and Qin Dahe, eds., Managing the Risks of Extreme Events and Disasters to Advance Climate Change Adaptation: Special Report of the Intergovernmental Panel on Climate Change (Cambridge: Cambridge University Press, 2012). Galand, Lionel, “Du berbère au libyque: une remontée difficile”, Lalies, 16 (1996), 77-98. —, “L’écriture libyco-berbère”, Sahara, 11 (1999), 143-45. —, “Un vieux débat: l’origine de l’écriture libyco-berbère”, La lettre de répertoire des inscriprions libyco-berbères, 7 (2001), 1-3. Gallinaro, Marina, “Saharan Rock Art: Local Dynamics and Wider Perspectives”, Arts, 2 (2013), 350-82. Garcea, Elena A. 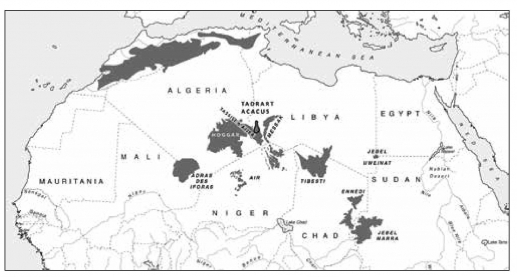 A., ed., Uan Tabu in the Settlement History of the Libyan Sahara (Florence: All’Insegna del Giglio, 2001). Gigliarelli, Ugo, Il Fezzàn (Tripoli: Governo della Tripolitania, Ufficio Studi, 1932). Liverani, Mario, “Imperialismo, colonizzazione e progresso tecnico: il caso del Sahara libico in età romana”, Studi Storici, 4 (2006), 1003-56. —, ed., Aghram Nadharif: The Barkat Oasis (Sha ‘ Abiya of Ghat, Libyan Sahara) in Garamantian Times (Florence: All’Insegna del Giglio, 2005). Mattingly, David J., ed., The Archaeology of Fazzan. Volume 1: Synthesis (London: Society for Libyan Studies, 2003). —, ed., The Archaeology of Fazzan. 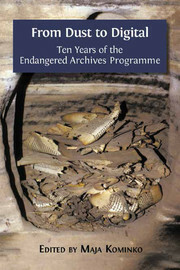 Volume 2: Site Gazetteer, Pottery and Other Survey Finds (London: Society for Libyan Studies, 2007). —, ed., The Archaeology of Fazzan. Volume 3: Excavations of C. M. Daniels (London: Society for Libyan Studies, 2010). Mori, Fabrizio, Tadrart Acacus: arte rupestre e culture del Sahara preistorico (Turin: Einaudi, 1965). Mori, Lucia, ed., Life and Death of a Rural Village in Garamantian Times: The Archaeological Investigation in the Oasis of Fewet (Libyan Sahara) (Florence: All’Insegna del Giglio, 2013). Pichler, Werner, Origin and Development of the Libyco-Berber Script (Cologne: Köppe, 2007). Scarin, Emilio, “Nomadi e Seminomadi del Fezzan”, in Il Sahara Italiano: Fezzan e Oasi di Gat. Parte Prima, ed. by Reale Società Geografica Italiana (Rome: Società Italiana Arti Grafiche, 1937), pp. 518-90. Wilson, Andrew, “Saharan Trade in the Roman Period: Short-, Medium-and Long-Distance Trade Networks”, Azania, 47/4 (2012), 409-49. Zerboni, Andrea, Isabella Massamba N’siala, Stefano Biagetti and Savino di Lernia, “Burning without Slashing: Cultural and Environmental Implications of a Traditional Charcoal Making Technology in the Central Sahara”, Journal of Arid Environments, 98 (2013), 126-31. 1 The Archaeology of Fazzan. Volume 1: Synthesis, ed. by David J. Mattingly (London: Society for Libyan Studies, 2003); The Archaeology of Fazzan. Volume 2: Site Gazetteer, Pottery and Other Survey Finds, ed. by David J. Mattingly (London: Society for Libyan Studies, 2007); and The Archaeology of Fazzan. Volume 3: Excavations of C. M. Daniels (London: Society for Libyan Studies, 2010). 2 Aghram Nadharif: The Barkat Oasis (Sha ‘Abiya of Ghat, Libyan Sahara) in Garamantian Times, ed. by Mario Liverani (Florence: All’Insegna del Giglio, 2005); and Life and Death of a Rural Village in Garamantian Times: The Archaeological Investigation in the Oasis of Fewet (Libyan Sahara), ed. by Lucia Mori (Florence: All’Insegna del Giglio, 2013). 3 David Edwards, “Archaeology in the Southern Fazzan and Prospects for Future Research”, Libyan Studies, 32 (2001), 49-66; Mario Liverani, “Imperialismo, colonizzazione e progresso tecnico: il caso del Sahara libico in età romana”, Studi Storici, 4 (2006), 1003-56; and Andrew Wilson, “Saharan Trade in the Roman Period: Short-, Medium-and Long-Distance Trade Networks”, Azania, 47/4 (2012), 409-49. 4 Mauro Cremaschi and Savino di Lernia, “The Geoarchaeological Survey in the Central Tadrart Acacus and Surroundings (Libyan Sahara): Environment and Cultures”, in Wadi Teshuinat: Palaeoenvironment and Prehistory in South-Western Fezzan (Libyan Sahara), ed. by Mauro Cremaschi and Savino di Lernia (Milan: CNR, 1998), pp. 243-325. 5 Fabrizio Mori, Tadrart Acacus: Arte rupestre e culture del Sahara preistorico (Turin: Einaudi, 1965); Barbara E. Barich, “La serie stratigrafica dell’Uadi Ti-N-Torha (Acacus, Libia)”, Origini, 8 (1974), 7-157; Barbara E. Barich, “The Uan Muhuggiag Rock Shelter”, in Archaeology and Environment in the Libyan Sahara: The Excavations in the Tadrart Acacus, 1978-1983, ed. by Barbara E. Barich (Oxford: BAR International Series, 1987), pp. 123-219; Uan Afuda Cave: Hunter-Gatherer Societies of the Central Sahara, ed. by Savino di Lernia (Florence: All’Insegna del Giglio, 1999); Uan Tabu in the Settlement History of the Libyan Sahara, ed. by Elena A. A. Garcea (Florence: All’Insegna del Giglio, 2001); and Stefano Biagetti and Savino di Lernia, “Holocene Deposits of Saharan Rock Shelters: The Case of Takarkori and Other Sites from the Tadrart Acacus Mountains (Southwest Libya)”, African Archaeological Review, 30/3 (2013), 305-38. 6 Julie Dunne et al., “First Dairying in ‘Green’Saharan Africa in the 5th Millennium BC”, Nature, 486 (2012), 390-94; and Mary Ann Tafuri et al., “Inside the ‘African Cattle Complex’: Animal Burials in the Holocene Central Sahara”, PLoS ONE, 8 (2013), http://www.plosone.org/article/info%3Adoi%2F10.1371%2Fjournal.pone.0056879. 7 Roberto Castelli, Maria Carmela Gatto, Mauro Cremaschi, Mario Liverani and Lucia Mori, “A Preliminary Report of Excavations in Fewet, Libyan Sahara”, Journal of African Archaeology, 3 (2005), 69-102; and Mori, Life and Death of a Rural Village. 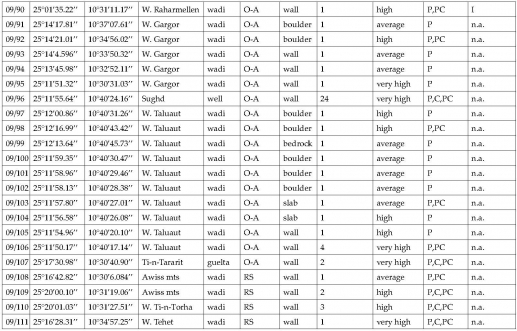 9 Sand, Stones, and Bones: The Archaeology of Death in the Wadi Tanezzuft Valley (5000-2000 BP), ed. by Savino di Lernia and Giorgio Manzi (Florence: All’Insegna del Giglio, 2002). 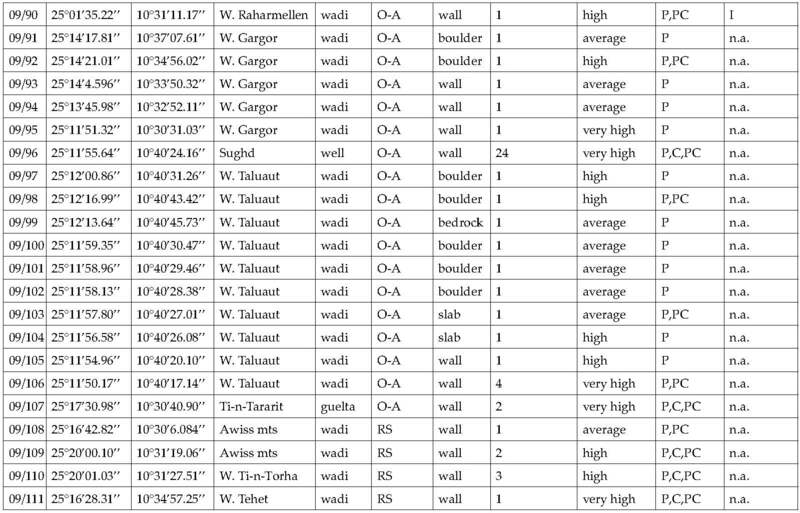 10 Stefano Biagetti and Savino di Lernia, “Combining Intensive Field Survey and Digital Technologies: New Data on the Garamantian Castles of Wadi Awiss, Acacus Mountains, Libyan Sahara”, Journal of African Archaeology, 6/1 (2008), 57-85. 11 Stefano Biagetti, Ethnoarchaeology of the Kel Tadrart Tuareg: Pastoralism and Resilience in Central Sahara (New York: Springer, 2014); Stefano Biagetti and Jasper Morgan Chalcraft, “Imagining Aridity: Human-Environment Interactions in the Acacus Mountains, South-West Libya”, in Imagining Landscapes: Past, Present, and Future, ed. by Monica Janowski and Tim Ingold (Farnham: Asghate, 2012), pp. 77-95; Savino di Lernia, Isabella Massamba N’siala and Andrea Zerboni, “‘Saharan Waterscapes’: Traditional Knowledge and Historical Depth of Water Management in the Akakus Mountains (SW Libya)”, in Changing Deserts: Integrating People and Their Environment, ed. by Lisa Mol and Troy Sternberg (Cambridge: White Horse Press, 2012), pp. 101-28; and Andrea Zerboni, Isabella Massamba N’siala, Stefano Biagetti and Savino di Lernia, “Burning without Slashing: Cultural and Environmental Implications of a Traditional Charcoal Making Technology in the Central Sahara”, Journal of Arid Environments, 98 (2013), 126-31. 12 Managing the Risks of Extreme Events and Disasters to Advance Climate Change Adaptation: Special Report of the Intergovernmental Panel on Climate Change, ed. by Christopher Field, Vicente Barros, Thomas F. Stocker and Qin Dahe (Cambridge: Cambridge University Press, 2012). 13 Biagetti, Ethnoarchaeology of the Kel Tadrart Tuareg; Biagetti and Chalcraft, “Imagining Aridity”; di Lernia, N’siala and Zerboni, “Saharan Waterscapes”; and Zerboni, N’siala, Biagetti and di Lernia, “Burning Without Slashing”. 15 Mohamed Aghali-Zakara and Jeannine Drouin, “Écritures libyco-berbères: vingt-cinq siècles d’histoire”, in L’aventure des écritures: naissances, ed. by Anne Zali and Annie Berthier (Paris: Bibliothèque Nationale de France, 1997), pp. 99-111; Lionel Galand, “L’écriture libyco-berbère”, Sahara, 10 (1999), 143-45. 16 Gabriel Camps, “Recherches sur les plus anciennes inscriptions libyques de l’Afrique du nord et du Sahara”, Bulletin archéologique du C. T. H. S., n. s. (1974-1975), 10-11 (1978), 145-66; José Farrujia de la Rosa, Werner Pichler and Alain Rodrigue, “The Colonization of the Canary Islands and the Libyco-Berber and Latino-Canarian Scrips”, Sahara, 20 (2009), 83-100; Lionel Galand, “Du berbère au libyque: une remontée difficile”, Lalies, 16 (1996), 77-98; Lionel Galand, “Un vieux débat: l’origine de l’écriture libyco-berbère”, La lettre de répertoire des inscriprions libyco-berbères, 7 (2001), 1-3; and Werner Pichler, Origin and Development of the Libyco-Berber Script (Cologne: Köppe, 2007). 17 Mohamed Aghali-Zakara and Jeannine Drouin, Inscriptions rupestres libyco-berbères: Sahel nigero-malien (Geneva: Droz, 2007); Camps; and Pichler. 18 Ali Ait Kaci, “Recherche sur l’ancêtre des alphabets libyco-berbères”, Libyan Studies, 38 (2007), 13-37. 21 Stefano Biagetti, Ali Ait Kaci, Lucia Mori and Savino di Lernia, “Writing the Desert. 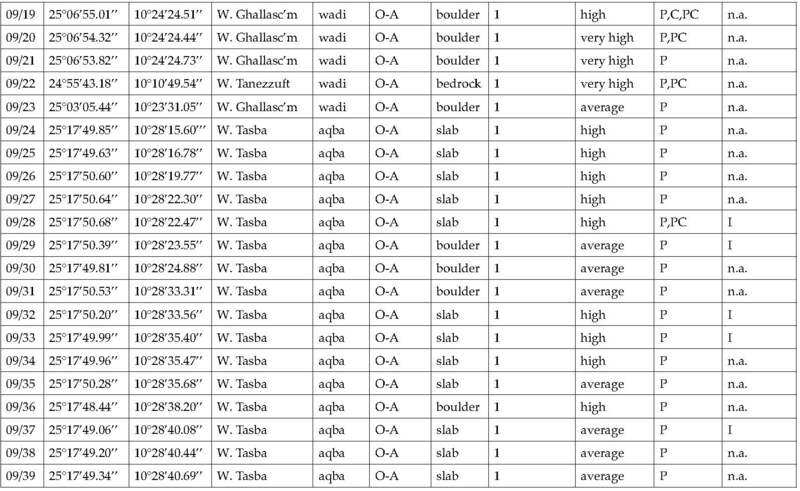 The ‘Tifinagh’ Rock Inscriptions of the Tadrart Acacus (South-West Libya)”, Azania, 47/2 (2012), 153-74. 25 Christopher Chippindale and George Nash, “Pictures in Place: Approaches to the Figured Landscape of Rock Art”, in The Figured Landscapes of Rock-Art: Looking at Pictures in Place, ed. by Christopher Chippindale and George Nash (Cambridge: Cambridge University Press, 2004), pp. 1-36. 26 Biagetti, Ethnoarchaeology of the Kel Tadrart Tuaregi; Ugo Gigliarelli, Il Fezzàn (Tripoli: Governo della Tripolitania, Ufficio Studi, 1932); Mori, Tadrart Acacus; and Emilio Scarin, “Nomadi e seminomadi del Fezzan”, in Il Sahara italiano: Fezzan e Oasi di Gat. Parte prima, ed. by Reale Società Geografica Italiana (Rome: Società Italiana Arti Grafiche, 1937), pp. 518-90. 28 Ibid., pp. 113-15; Biagetti, Ethnoarchaeology of the Kel Tadrart Tuareg; and Biagetti and Chalcraft, “Imagining Aridity”. 33 Savino di Lernia and Marina Gallinaro, “Working in a UNESCO WH Site: Problems and Practices on the Rock Art of the Tadrart Acacus (SW Libya, central Sahara)”, Journal of African Archaeology, 9 (2011), 159-75; and Marina Gallinaro, “Saharan Rock Art: Local Dynamics and Wider Perspectives”, Arts, 2 (2013), 350-82. 34 Tertia Barnett and David J. Mattingly, “The Engraved Heritage: Rock-Art and Inscriptions”, in The Archaeology of Fazzan. Volume 1: Synthesis, ed. by David J. Mattingly (London: Society for Libyan Studies, 2003), pp. 279-326; and di Lernia and Gallinaro, “Working in a UNESCO WH Site”. 37 Cremaschi and di Lernia, “The Geoarchaeological Survey in the Central Tadrart Acacus and Surroundings”. 41 Savino di Lernia, Marina Gallinaro and Andrea Zerboni, “Unesco World Heritage Site Vandalized: Report on Damages to Acacus Rock Art Paintings (SW Libya)”, Sahara, 21 (2010), 59-76, Fig. 10. We were told of further acts of vandalism by Ali Khalfalla, DoA representative in Ghat-Acacus area. 42 The research for this article was funded by a Major Project Grant from the Endangered Archives Programme of the British Library (Savino di Lernia as Principal Investigator), and included in the activities of the Italian-Libyan Archaeological Mission in the Acacus and Messak Sapienza University of Rome and the Libyan Department of Archaeology (Tripoli and Sebha), directed by S. di Lernia and funded by Grandi Scavi di Ateneo (Sapienza), and the Italian Ministry of Foreign Affairs (DGPCC/DGPS) entrusted to S. di Lernia. We thank Lucia Mori, who took part in the research project. We wish to thank Giuma Anag and Salah Agahb, former chairmen of the DoA, for their support of the project, and Saad Abdul Aziz for his help and advice. We are very grateful to Mohammed Hammadani for his contribution in the field. We are indebted to Cathy Collins and Lynda Barraclough from the EAP for their support and co-operation. We express our gratitude to Maja Kominko, who has enthusiastically followed all the editing, showing strong support and patience. Ultimately, we thank the anonymous reviewers for their thoughtful and useful comments. BIAGETTI, Stefano ; AIT KACI, Ali ; et DI LERNIA, Savino. 1. The “written landscape” of the central Sahara: recording and digitising the Tifinagh inscriptions in the Tadrart Acacus Mountains In : From Dust to Digital : Ten Years of the Endangered Archives Programme [en ligne]. Cambridge : Open Book Publishers, 2015 (généré le 20 avril 2019). Disponible sur Internet : <http://books.openedition.org/obp/2219?nomobile=1>. ISBN : 9782821876262. Biagetti, Stefano, et al.. “1. The “written landscape” of the central Sahara: recording and digitising the Tifinagh inscriptions in the Tadrart Acacus Mountains”. Kominko, Maja. From Dust to Digital : Ten Years of the Endangered Archives Programme. Cambridge : Open Book Publishers, 2015. (pp. 1-29) Web. <http://books.openedition.org/obp/2219?nomobile=1>.